The title The Angel and the Brute Sing Songs of Rapture may conjure an elaborate theatrical vocal production but it is neither that, nor anything else that is even remotely familiar. Pianist/composer Eli Wallace and drummer Rob Pumpelly make up the duo Dialectical Imagination and describe their blend of free improvisation and chamber music as "ecstatic music," a description thatmore often than notis a surprisingly concise account of music that is rarely as succinct itself. A California native, now firmly embedded in the New York music scene, across multiple genres of improvisation, modern jazz, rock and classical music, Wallace holds both a Bachelor's and a Master's of Music, from the New England Conservatory studying with Jason Moran and Jerry Bergonzi among others . Pumpelly has shared the stage with Wallace as part of a Bay Area group called Will Redmond's Transcontinental Blow-Up Telethon. Though he confines his work here to drums, he has played bassoon in local orchestras and guitar in both rock and classical settings. The Angel and the Brute... is Wallace and Pumpelly's recording debut as a duo. On "Refusing Confusion" Pumpelly lightly brushes the cymbals amid Wallace's sometimes sparse, sometimes complex patterns. Rich in texture and off-kilter melodies, it is the front-end of more accessible bookend compositions in the collection. The opener segues seamlessly into "Immutable Light," with Wallace exuding a kind of gothic stateliness to start with, then giving way to the tribal rhythm of an excellent extended solo from Pumpelly. "Sky in Eye, Free of 'I'" is an improvisation of raw energy building into a firestorm of crashing notes and frenetic percussion, only to close in unassuming quiet. "Rungs" and "Turnabout" are more openly free pieces; agitated and thorny, full of discordant melodies and washes of percussion, neither is restricted by structural rubrics. "Turnabout," while alternating between free jazz and avant-garde, manages to give a nod to classical elements as well. The album closes with "Deepest View's Horizon You," ending the collection with an orchestral ambience, drawing melodies from within profuse harmonies. 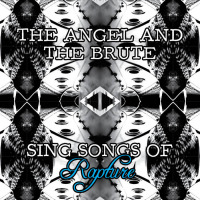 The Angel and the Brute Sing Songs of Rapture presents musical enigmas to be sure, but it reliably spikes with energy and intelligence that cannot be overlooked. Even when the playing reaches its maximum freedom, Wallace and Pumpelly approach the music with a clear purpose, if not a conventional methodology. Wallace plays with the brilliance of Matthew Shipp and Alexander Hawkins combined and Pumpelly's multi-instrumental background enables him to bring a distinct musicality to the drum kit. This is a unique album, full of surprises and it rewards repeated listening. Track Listing: Refusing Confusion; Immutable Light; Sky in Eye, Free of "I"; Rungs; Turnabout; Deepest View's Horizon You. Personnel: Eli Wallace: piano; Rob Pumpelly: drums.